Pan Tadeusz is an epic poem written in Polish by Adam Mickiewicz, first published in Paris in 1834. It is generally considered one of the greatest masterpieces of Polish literature and a national epic of Poland. Set during the Napoleonic era in a fictional idyllic village of Soplicowo somewhere in the former Grand Duchy of Lithuania, or in modern-day Belarus, the poem tells a story of litigation over ruins of an old castle between two noble families – Soplica and Horeszko – against the backdrop of an anticipated Franco-Russian war. The poem is also a literary monument to Old Polish culinary traditions. Some of the dishes appearing in Pan Tadeusz have long been forgotten, while others – such as bigos and zrazy – remain favorites of modern Polish cuisine. Unless indicated otherwise, all English quotations are from Marcel Weyland's translation. Lithuanian cold barszcz all proceeded to eat. And Lithuanian cold barszcz all proceeded to eat. With each cup a small pitcher containing the cream. Is as fragrant as mocca, and as honey viscid. So that each one is dressed in a separate coat. At the end, as the last course, zrazy were served. In which curds, densely floating, of cream cheese appear. At the end, as the last course, 'zrazy' were served. Thuswise was in the Judge's house breakfast observed. 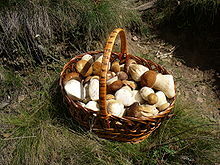 After slender boletus the young ladies throng, which is famed as the colonel of mushrooms in song. And more strange, on them will not an insect alight. Which is famed as the colonel of mushrooms in song. Put away. But the Tribune, of course, 'fly-bane' gathered. Carried tree-and-mulch mushrooms, brown, ochre, and rosy. Like a baldachin, covering the sky overhead. Flakes of gold in the goblets, and in the sun glowed. In the pots warmed the bigos; mere words cannot tell of its wondrous taste, colour and marvellous smell. Steam, as if from a dormant volcano's deep crater. And Lithuanian cold barszcz in the silence consumed. From whose breasts, transfixed lately, forks stiffly protrude. While Razor his sabre sank deep in each throat. Sticking old boars and piglets below shoulder blade. Cockerils, and the rough-feathered, and big-crested hens. Perfect poultry, which never for pearl barley lacked. And soon bowl, bottles, sugar and sliced beef were brought. And downed half a huge bowl of most excellent punch. Soon has five, and they labour, while he them directs. Drew a book from his bosom, unwrapped it, and read. In Lithuania today yet in popular tale. The skilled cooks at once carry all out to the letter. (In a well-to-do house such waste can be forgiven). You would say, only bird's milk could be lacking here. Unite in Soplicowo: there's plenty, and art. The Tribune a gold coin and of pearls not a few. Followed by other dishes, but who can them tell! The flounder and mature carp, carp 'royal' and young! At its tail end and swimming in sauce, a ragout. Book Twelve, Love and Friendship! That horn of Amaltheia – a carrot, no less! So farewell to the spell! To the charm! To the wonder! They proceeded to Jankiel's to drink and to play. In between ran the hostess who held a quart pot. Like a pike cooked in saffron, all glitter and glow. You know, my friend, he's only some sixteenth cousin to the Horeszkos, the tenth water on the kisiel. Kisiel is a Lithuanian dish, a sort of jelly made of oaten yeast, which is washed with water until all the mealy parts are separated from it: hence the proverb. One of vodka, of mead one, the third full of beer. Into hundred mugs gush, in umpteen glasses ring. Of timbers cross-wise fastened, not unlike a cage. Miss Hreczeha's home drugstore all hanging within it. Me, me, Jacek, a bowl of black gruel to serve! Something rather substantial to go with your mead..."
This page was last edited on 27 September 2017, at 15:18.